Mal the dog here. I know that it's not Christmas, but it seems that my author person is getting worse and worse at procrastination. She was working on the next book in the series, Fudge Bites, out in 2019 when she looked at the date and said. "Oh, no! I have a blog due in a few hours!" Mal to the rescue. I told her not to worry. I would be happy to write the blog for her. I'm not a woman's best friend for no reason. As long as there's a treat involved, I'm all in...or a tummy rub. I'll take a tummy rub...or a ball toss. I like a nice ball toss. Never count on a dog to do a cat's work, I say. I'm Mella and unlike Mal, I'm not distracted by squirrels or pets or even treats. Let me tell you about Forever Fudge. First off, it's out the end of September 2018. This time Mal and I help Allie find a killer who is focused on out smarting our gal. But the killer doesn't know that Mal and I are on the case. You see there's a pilot being filmed on the island. Someone got the idea to set a mystery series on Mackinac and Mal and I can't help but sneak into as many scenes as possible. I mean, darling the camera loves me. Oh and then there's this handsome movie star who looks a bit like Thor and he's following Officer Rex Manning around for inspiration. Which sort of complicates Allie's love life. Then there's the killer who, like a good cat, keeps putting dead things in Allie's path. I drag in dead things sometimes but not on this scale. I'm a big Blue Bloods fan! I like to watch Judge Judy. It makes me feel good about my life. We are huge Blue Bloods and NCIS anything watchers. We have a retired Appellate Judge and a Sitting State Supreme Justice in the family so we don't watch Judy or the other ones. 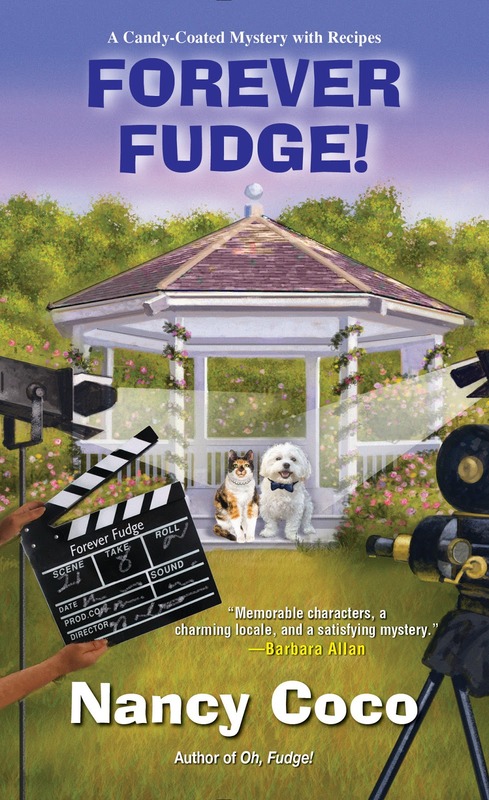 I'd love to add this latest Fudge series book to my home library. How To Get Away With Murder. Love Shonda Rhimes. Scandal is a close 2nd. I love to watch The Big Bang Theory and cooking shows. My favorite series at the moment is Blue Bloods. I love all the character and feel like they are family. I also love all the murder mysteries on Hallmark. Love all those character too. Thanks for the chance to win. I love you books about Mackinac. One of my favorite places on earth. Thanks for all the memories and fun reading. I like the Hallmark series When Calls the Heart. My favorite tv show is Murder She Wrote & McMillan & Wife. Love the classic shows. My favorite tv shows are Bull, Deception, Survivor, The Big Bang Theory, and reruns of Seinfeld. The Big Bang Theory is my favorite TV show. It is so funny! The Fudge Shop series is one of my favorites, I can picture Mackinac Island while reading them. Kay - you are the winner- I will be emailing you soon! Almost anything on PBS' Masterpiece Mystery!. Every once in a while there's a stinker, but it's rare.